FORT MYERS — David Ortiz pulled down his iPhone from the top of his locker and, proudly, showed off the photos. He looked both happy and absurd, a police helmet jammed on the top of his bulked up hair, a suit on, and a tie around his neck … Oh, and he was stuffed into the sidecar of a motorcycle (Photo courtesy of Lori Ducharme). Ortiz wasn’t the only one to jump on the sidecar — Terry Francona and Kyle Snyder also took rides. The only complaint was that it was a bit chilly for the wind to be blowing in their faces. “It was fun, but it was too cold, man,” Ortiz said. “It wasn’t a good idea but Tito forced me to do it. He said he did it, so I didn’t want to look like a [coward]. So I did it. 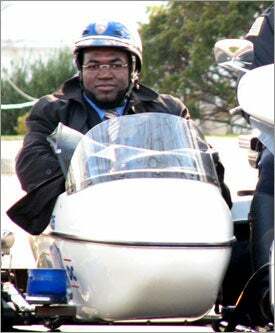 Francona rode in the sidecar from the airport to the White House, Ortiz jumped in from the White House to Walter Reed Hospital, then Snyder took the final ride (which he said was three times longer than either of the other ones) from the hospital to the airport. With his face frozen, and his knees squeezed into the tiny sidecar, Snyder said he was going about 40-45 mph on the sidecar. He enjoyed it, saying he had to stay in the car for pride. He wasn’t going to get the officer to pull over and let him get back in the bus — he wouldn’t have heard the end of that one. As for his face? It warmed up. About 10 minutes into the flight back to Fort Myers.